Brandi Reynolds, CAMS-Audit has over 14 years’ experience in the financial services industry. She has delivered efficient and effective solutions in areas of compliance program development, compliance monitoring and testing, and training in relation to federal consumer protection laws and regulations and anti-money laundering laws. Throughout her career, Brandi has gained extensive knowledge in the areas of state and federal compliance and risk management. Brandi is the founder of CorCom , LLC, a consulting firm specializing in Anti-Money Laundering (AML) and Financial Crimes Prevention (FCP). CorCom has extensive expertise in program development, independent BSA/AML/OFAC testing, and consumer compliance. 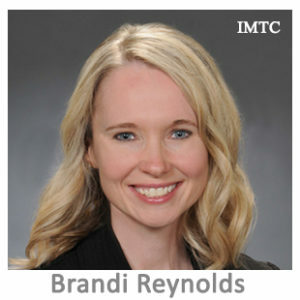 In 2018, Brandi began her collaborative work with IMTC joining Connie Fenchel in teaching IMTC’s Money Transfer Compliance Certification Course (MTCC) as well as cooperating with subjects & ideas for IMTC’s Compliance & Regulatory Panels at IMTC Conferences.